Website optimization is can be an overwhelming endeavor due to the fact that it encompasses so many strategic and technical issues. However, this hands-on, task-based book demystifies this potentially intimidating topic by offering smart, practical, and tested instructions for developing, implementing, managing, and tracking website optimization efforts. After you learn how to establish an optimization framework, you then dive into learning how to develop a plan, test appropriately and accurately, interpret the results, and optimize in order to maximize conversion rates and improve profits. 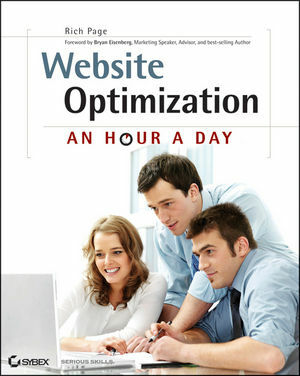 Full of interesting case studies and helpful examples drawn from the author's own experience, Website Optimization: An Hour a Day is the complete solution for anyone who wants to get the best possible results from their web page. Rich Page is a Conversion Specialist at Adobe, working with Fortune 500 clients to help improve their website optimization strategies. Rich has been analyzing, testing, and improving websites for over 10 years and has previously worked for Disney Online in their web analytics and optimization team. He has a unique background of online marketing, web usability, and analytics, and has a popular web analytics and optimization blog at rich-page.com. He is also a regular speaker at industry conferences and the coauthor of Landing Page Optimization, Second Edition.